The euro vs dollar surged higher yesterday closing as a wide spread up candle which held above all four moving averages once again and confirming that the recent short term re-tracement for the pair is now firmly over. Throughout this period of consolidation and re-tracement the 40 day moving average remained unbroken and, as such, confirmed that this was only a temporary reprieve for the US dollar ahead of next week’s FED meeting on Wednesday which is likely to confirm the rollout of the QE2 programme. In the last few minutes we have had the release of Q3 advance GDP in the US which came as forecast at 2.% and, as such, adds further weight to the likelihood that the FED will indeed begin its QE2 programme early in November. This will be dollar negative, sending the usd index dramatically lower and the euro higher, as a result. From a technical perspective we can expect to see a breach of the USD1.4000 level in due course and the meeting on Wednesday may well trigger a break above the high of earlier in Oct at USD1.4159. Any clearance at this level will then provide a solid platform of support which should see the euro vs dollar climb to re-test the USD1.4257 region and thereafter the USD1.4480 level last seen in early 2010. 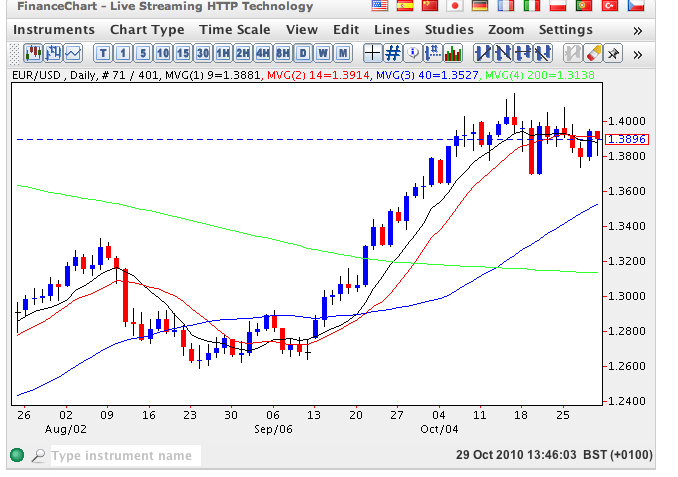 The longer term weekly chart supports this analysis as the price continues to hold above all four moving averages here.